Welcome to my humble Website, this site is aimed at those who may be interested in my V-twin project, known as "V2mac"
Believe it or not this project started out as a model steam engine, it quite quickly became obvious to me that I was losing interest when I started having thoughts that when it was finished, if that day ever came, the best it would ever do was to sit on a bench top and go chuff-chuff. Don’t get me wrong, I’ve nothing but admiration for the individuals that produce some brilliant work but I really felt I needed to produce something more in line with my lifelong interest, “motorcycles”. I didn’t initially wish to embark on another restoration so having been a fan of V-twins since running a Morgan 3 wheeler, I thought,” I know what I’ll do, I’ll build my own engine”. I already had a couple of dead Velocette Alloy MAC engines so it was a no brainer as to what to use as donor parts. I would’ve been happy to just get it to run but it;s exceeded all my expectations and is really good fun to ride. Quite a fair amount of the very early stages of work centred around deciding which of the Velo parts could be used, which would be used and what I would have to fabricate. The plan was to use as many parts from the donor engines as possible, a strategy that would cause a fair amount of head scratching. Not really anticipating I would actually be able to use it the initial build was primarily done with second hand parts apart from pistons, and bearings. The whole project has had a rather long gestation period that started in 2005, naturally I’ve not been working on it continuously since then but only when finances and other commitments permitted. Shortly after starting I was made redundant from my work and it did rather get off to a false start. Not everyone will agree with what follows but it’s good that we are all different. Along the way I have wasted time on an A65 BSA, hated that! A Reddich Royal Enfield 350 Bullet, just to have something to ride, had to repair the engine, including machining, ambivalent about that, swapped it for an ex WD 3HW Triumph, still waiting it’s turn, this was followed by a re-import T150 Triumph, the jury is still out on that one, can’t quite make up my mind, and just over a year ago I bought a Velocette Venom, which also took some time out. So it’s not surprising it took me so long. 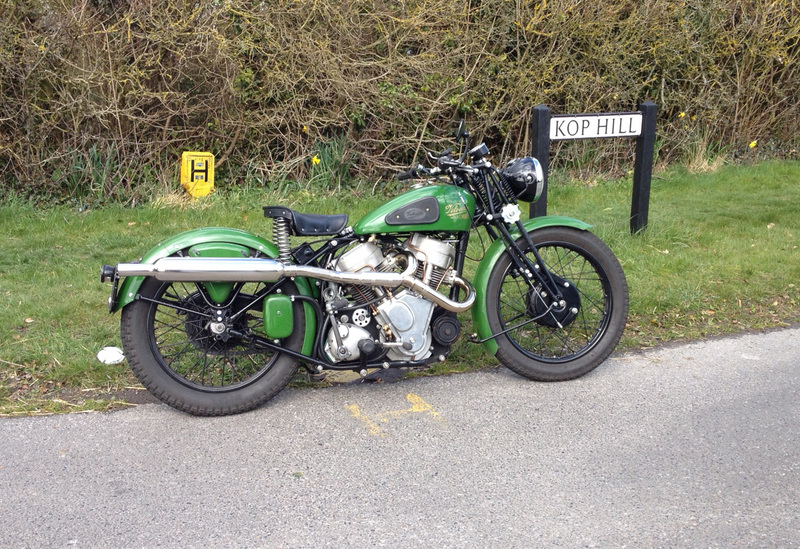 My V2mac, for that’s what I call it, I’ve never referred to as a Velocette, for anyone who may think otherwise. It was recently referred to by a member of the local vintage motorcycle crowd as just a BSA with a few Velocette parts thrown at it, If only it were that simple. For those of the purist persuasion this may be the moment to leave this article for I make no excuses as to what this bike is about, for those more broad minded, read on. Not being from an engineering background but woodworking, I’m quite used to reading architectural drawings but not fully conversant with engineering drawings, and my ability to put my ideas on paper are somewhat limited. Most of my fabricating and machining has been from my head or rough sketches. A large proportion of my woodworking entailed setting and operating machines so I merely transferred my skills to engineering machinery. As previously stated most of the components came from my fifty year collection of scrap (my wife’s description). The crankcases and timing chest are machined from solid billet aluminium. The decision to go down this route was taken following very disappointing conversations with several foundries, namely lack of interest in prototype work and silly suggestions of prices, I’m sure they were just to get me to go away. Pity really as I was quite looking forward to trying my hand at pattern making. Ironically, the website of one of the foundries, which is in the nearest town to me is now advertising their ability to take on prototype work, maybe I’ll go and see them again when I start my next project, perhaps I might get a better response. Total cost for crankcases and timing chest, £380. It would be unrealistic to price my time. On a point of interest, it’s amazing how much a few blocks of aluminium can bulk up when one starts making swarf. Machining commenced with the crankcases, on the lathe to create the basic shape, this entailed producing the internal recess for the flywheels which then gave me a reference to work from. The remaining machining was carried out on the milling machine and rotary table. Once I had the internal diameter I was able to make some templates that enabled me to relocate the centre with good repeatability, thereby enabling me to remove the crankcases from the machines and readily relocate when required. The main bearing housings were line bored on the mill. The timing case was totally machined on the mill, again referring to the crank centre using the template. One of the few items I did commit to paper was the crankshaft. I had decided to use the Velo connecting rods, side by side, part of the desire to use as many components from the donor engines, little did I appreciate the issues this would cause. I could have used a pair of Harley Sportster rods and crankpin which would have enabled the cylinders to be inline rather than offset, it would also have kept the timing gear and pushrods inline, thereby simplifying the timing gear, that’s the trouble with trying to reinvent the wheel. It’s not until embarking on a project such as this that one realises the knock on effect of what appear to be minor decisions and how they can come back to bite you later on. The crankshaft is made from EN24T, machined on my lathe and finished to dimension on an old Myford cylindrical grinder which I was obliged to buy with a surface grinder as they came as a pair, the surface grinder has now gone but I wouldn’t part with the Myford, so useful. The first time the engine ran it was on a crankpin that I made myself but I chickened out when it came to actually using it in earnest so I succumbed to having one professionally made at Alpha Bearings in Dudley, really helpful, and they didn’t laugh at my handy-work. I always intended that if by any chance the engine worked it had to go into a standard wheelbase frame, so the constraints of this did dictate some decisions, though not dramatically. I settled on 50 degrees for cylinders as much for aesthetic reasons, 45 degrees would give a little more room in the frame but would give less room between the cylinders for carb and exhaust, 50 degrees also meant I had access to existing ignition systems which are available for the Vincent twins, I didn’t wish to add to the work load and complexity, not to mention the possible unreliability of using a magneto. I settled on a Pazon system, partly because they were happy to sell me just the parts I required. The flywheels are the same diameter as the MAC originals but each one is 5mm wider, this does unfortunately add 10mm to the overall crankpin length and the width of the engine but it’s still quite a narrow engine and the flywheel weight seems to be a good balance between acceleration and stored inertia, it also keeps the size of the banjo down to help fit in the frame. Crankshaft bearing journals are 35mm, ball-race and roller on the drive side and double row ball-race on the timing side, balanced to a factor of 57%, Bore and stroke are now 71 x 86 giving a capacity of 680cc, pistons are Triumph Pre-unit 650 Trophy and the compression ratio is 9 to1, carbs are 27mm concentric, I did originally start using 276 separate float carbs but I just couldn’t stop them flooding, it was so inconsistent, one day they would be fine the next I would have to turn the fuel on and off just to get it to run, frustrating to say the least. I do prefer the look of the older carbs, I’ll have to save up for some new ones. The consequence of machining the crankcase and timing case separately was that it meant there was more materiel between flywheels and timing gears than if it were a casting. This meant I couldn’t keep the pushrods perpendicular to the camshafts, even though it’s only about 5 degrees it would cause me trouble. Because I wished to keep the timing case as small as possible and to mimic Velo pre-war appearance, I opted not to use Velo rockers but to use the same system as Triumph twins but my tappet blocks and followers were to be set into the top face of the timing chest. This turned out to be a blind alley, as after making a pair of tappet blocks and a set of 4 tappets, when I assembled them for a trial rotation under load there was so much side load friction it lifted the tappet blocks from the timing chest, admittedly they weren’t fixed down but that was only under the load of one old valve spring, from this I concluded they wouldn’t last five minutes. I’d made the timing case to suit this system which meant there wasn’t enough room to use Velo rockers so I would have to come up with some of my own or remake the timing chest. I’d already made the camshafts utilising Velo M17/7 cams I didn’t want to alter those either, in reality this turned out to be a blessing in disguise as what I now have works really well despite my misgivings. The rockers I machined from an oil hardening grade of steel and hardened in my home made furnace made from a large coffee tin. For the Velo boys among you the follower radius is 1-1/4”, after around 850 miles they were holding up really well. As Bob Higgs, the builder of the Vulcan Velo V-twin would I’m sure agree, sorting the timing gear train is probably the biggest headache of the whole project which would be simplified if the cylinders were inline. I got round this issue by putting 2 pinions on the crank and 2 intermediate pinions, with the appropriate spacing, each one driving a single camshaft. The downside of doing this is that the outer crank pinion is a fair way from the bearing on a relatively small shaft. The rocker shafts, intermediate pinions and camshafts are supported by an aluminium plate behind the timing cover, fixed to this is the oil pump which is a Morgo gear pump intended for Pre-unit Triumph twins, which seems to be performing well, the plate provides part of the oil distribution system and following Velo practice the timing cover connects the pressurised side of the oil system to the rocker gear, I’ve added additional oil drains to the rocker boxes as the pushrod tubes are no longer the lowest point to carry the oil away. Having pretty much sorted the engine I needed to join engine and gearbox together, this is done utilising a 15mm aluminium plate which doubles as an engine plate and a mounting for the alternator and the ignition trigger housing, both being driven by a belt from the crank. I’d provisioned for a dynamo, I knew this would be marginal for output but not expecting to use the bike too much I felt I’d get away with it. In the meantime I bought a Venom, luck would have it this was fitted with an Alton alternator which it kindly donated to a more needy cause, the dynamo is now doing sterling service on the Venom the Alton is on the twin. Initially I had it running a little slow, it didn’t balance the demand in top gear until about 30 mph which is somewhat awkward in traffic after dark. I’ve now geared this higher to hopefully lower the balance speed, the down side to this is that I have also raised the overall drive gearing of the bike which in turn has effectively slowed the alternator back down a little. Primary drive is by belt to a Commando diaphragm clutch on an AMC gearbox, all this running dry behind a modified BSA chain-case C12, I think. The other rear engine plate is conventional, engine to frame. The engine first ran in a jury rigged frame June 2014, it quite took me by surprise how well it ran on a worn pair of carbs from a Trident, oil tight too. I now had to set about the cycle parts, I already knew I wanted it to be in a pre-war or early post-war style i/e girders and rigid. The frame is ex WD M20 BSA, you have to bear in mind the whole premise behind this bike was to utilise as many part from my stock, hence a motley collection of parts, I feel it turned out to look a fair rendition of a pre-war bike and not too much of a lash-up, as some bitsas can, you’ll just have to make up your own mind on that one. Front wheel is two BSA hubs back to back, laced into a second hand AMC rim, rear wheel is Royal Enfield, to utilise a cush drive, forks initially BSA teles, now changed for a pair of Norton girders, it was always my intention to use these but they were not usable when I had the rest of the bike ready, I needed to refurbish these and the rest was pretty much ready to go so I just fitted the teles to get it on the road. The first ride up the road was August 2015. The first excursion away from home was about 10 miles to my local classic bike tester, that way I knew there would be tools at the other end, they weren’t needed, but I did get a foretaste of the fuel flooding issue. As the miles were added to the engine it began to run better and I had more confidence in it, as stated earlier it’s now covered 1150 miles and I’ve not had to lay a spanner on it in that time whilst out and about, it’s also stayed oil tight. I was talked into running it up on a dyno by a friend of mine, this was quite a revelation, given that it was running on worn out valves and guides and suffering a fair amount of blow by the engine developed at the wheel 29 bhp @ 4600 with a road speed of 74 mph, maximum torque 40 ft lbs @ 3000 rpm. It was still pulling well but I’d set a limit in my mind of 4500rpm until I’d been able to strip the engine for inspection, this I’ve now carried out and I’m really pleased in that there was nothing more required by way of rectification than the issues I’ve already pointed out. I am beginning to feel the engine is perhaps better than the frame, maybe I’ll transplant it to my Venom to see what it’s like in a more modern frame. 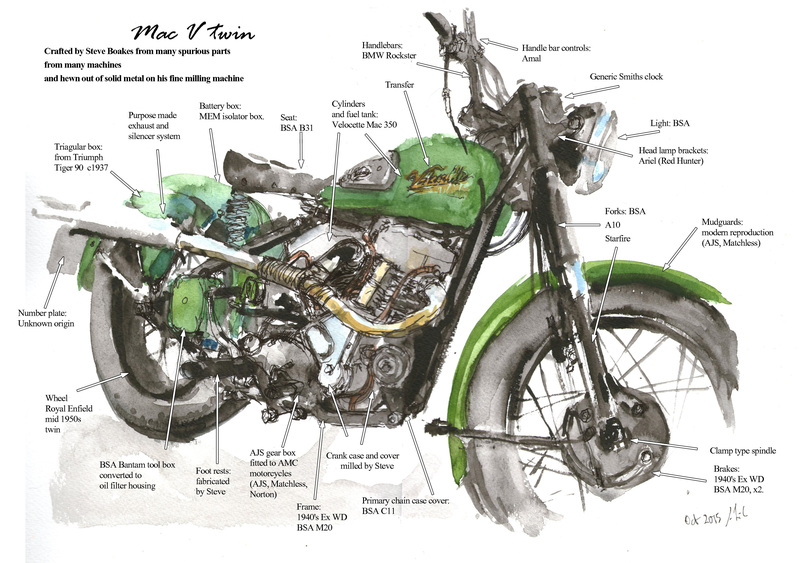 Quite fitting really that a book I referred to many times during the build for inspiration and confirmation of my thoughts was Motorcycle Engineering by Phil Irving, he who was so heavily involved with both Velocette and Vincent. It now has Norton 16H front forks which completes the look I had in mind, I have to say it has rather compromised the cornering ability in that they are a full three inches shorter than the BSA teles I fitted initially, also the steering was more neutral. The trouble is a girder and rigid bike at 80mph on our glorious modern pot-holed roads is interesting to say the least. The above was written late 2015, now (Feb 2018) it has covered 3500 trouble free miles and has proved very reliable. The fuel consumption is in the low 70's but the oil is starting to find it's way out, not really a problem, just a few drops when pushed a bit harder than normal. I have done another dyno run which was quite successful, achieving 34bhp and 44ft lb of tourqe, with a road speed of 95mph @ 5200 rpm. I've not been able to replicate the speed on the road for obvious reasons.